The Algoma Shanty Days 5K starts and finishes at the Robert Ray Gallery, formerly Algoma Farm Market Kitchen, with a view of the river and Lake Michigan. 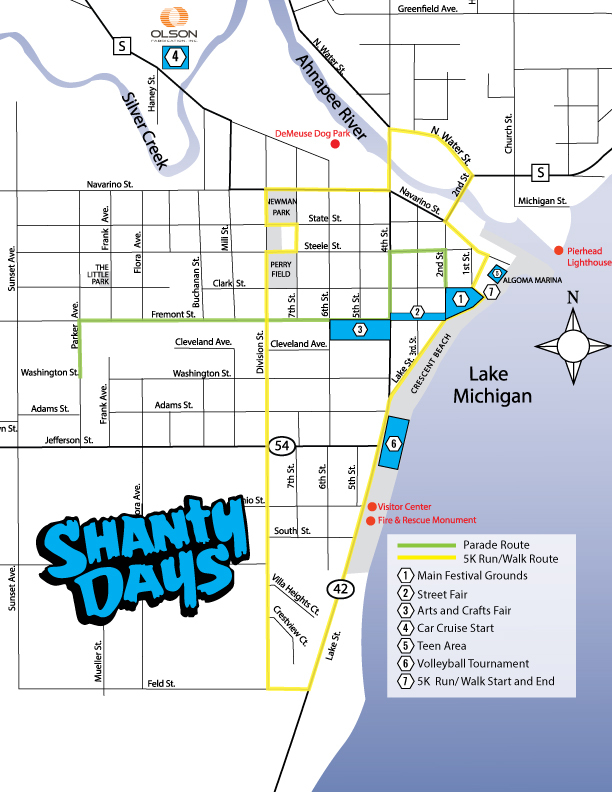 Race through town past historic von Stiehl Winery, catch a glimpse of the last 2 remaining shanties and by traveling downhill along the beautiful Lake Michigan shoreline to the finish! The race includes a t-shirt, special 25th Anniversary glass, chip-timing, post race refreshments, and same day race results. The Algoma Shanty Days Kids Fun Run is a non chip-timed event for children ages 9 and under. The route circles around the Algoma Shanty Days grounds, with a start and finish at the Farm Market Kitchen. Each registered participant gets a t-shirt and a participation ribbon. Superheroes join the race and the kids have a Super-Fun time! Bring your camera!